Venezuela, officially the Bolivarian Republic of Venezuela (Spanish: República Bolivariana de Venezuela), is a country on the northern coast of South America. The country comprises a continental mainland and numerous islands located off the Venezuelan coastline in the Caribbean Sea. Venezuela bordered by Guyana to the east, Brazil to the south, and Colombia to the west. Trinidad and Tobago, Grenada, St. Lucia, Barbados, Curacao, Bonaire, Aruba, Saint Vincent and the Grenadines and the Leeward Antilles lie just north, off the Venezuelan coast. Its size is 916,445 km² with an estimated population of 26,414,816. Falling within the tropics, Venezuela sits close to the equator, in the Southern Hemisphere. The flag colours are yellow, blue and red, in that order. The yellow stands for land wealth, the blue for courage, and the red for independence from Spain. A former Spanish colony, which has been an independent republic since 1821, Venezuela holds territorial disputes with Guyana, largely concerning the Essequibo area, and with Colombia concerning the Gulf of Venezuela. In 1895, after the dispute over the Guyana border flared up, it was submitted to a neutral commission, which in 1899 decided mostly in Guyana's favour. Today, the Bolivarian Republic of Venezuela is known widely for its petroleum industry, the environmental diversity of its territory, and its natural features. by Martin Tovar y Tovar. Venezuela is considered to be among the world's 18 most biodiverse countries, featuring diverse wildlife in a variety of protected habitats. 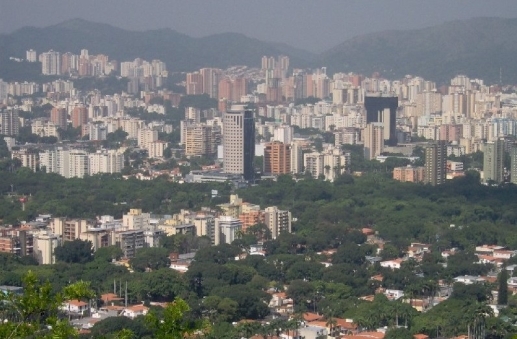 Venezuela is among the most urbanised countries in Latin America, the vast majority of Venezuelans live in the cities of the north, especially in the capital Caracas which is also the largest city. Other major cities include Maracaibo, Valencia, Maracay, Barquisimeto and Ciudad Guayana. for Progress December 16, 1961. * The "Bolivarian Republic of Venezuela" has been the full official title since the adoption of the new Constitution of 1999, when the state was renamed in honour of Simón Bolivar. * The Constitution also recognizes all indigenous languages spoken in the country. * Area totals include only Venezuelan-administered territory. * On January 1, 2008 a new bolivar, the bolivar fuerte (ISO 4217 code VEF), worth 1,000 VEB, was introduced. Venezuela's mainland rests on the South American Plate; With 2,800 kilometres (1,740 mi) of coastline, Venezuela is home to a wide variety of landscapes. The extreme northeastern extensions of the Andes reach into Venezuela's northwest and continue along the northern Caribbean coast. Pico Bolivar, the nation's highest point at 4,979 metres (16,335 ft), lies in this region. The country's centre is characterized by the llanos, extensive plains that stretch from the Colombian border in the far west to the Orinoco River delta in the east. 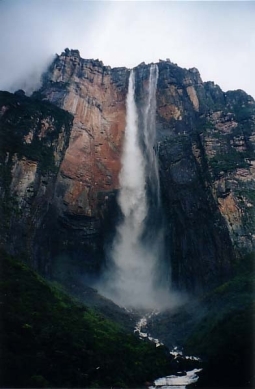 To the south, the dissected Guiana Highlands is home to the northern fringes of the Amazon Basin and Angel Falls, the world's highest waterfall. 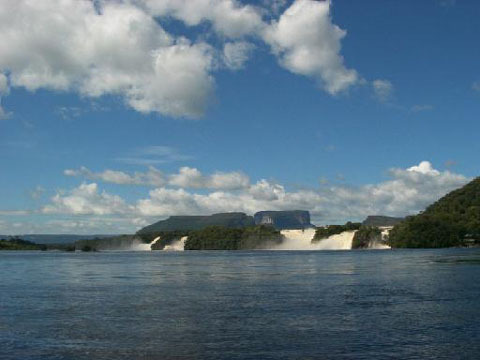 The Orinoco, with its rich alluvial soils, binds the largest and most important river system of the country; it originates in one of the largest watersheds in Latin America. The Caroni and the Apure are other major rivers. The country can be further divided into ten geographical areas, some corresponding to climatic and biogeographical regions. 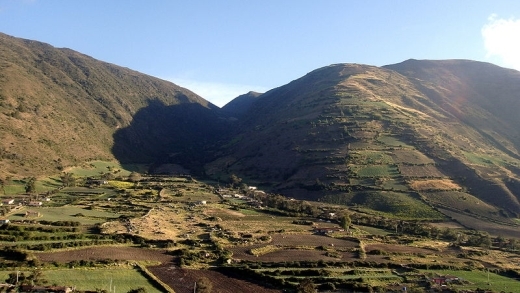 In the north are the Venezuelan Andes and the Coro region, a mountainous tract in the northwest, is home to several sierras and valleys. East of it are lowlands abutting Lake Maracaibo and the Gulf of Venezuela. 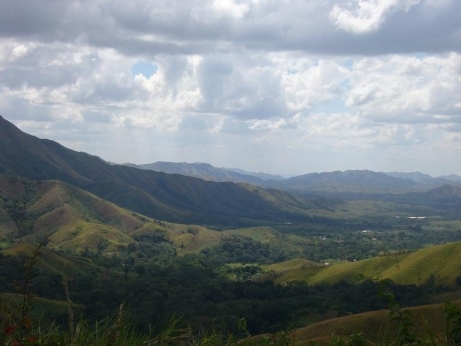 The Central Range runs parallel to the coast and includes the hills surrounding Caracas; the Eastern Range, separated from the Central Range by the Gulf of Cariaco, covers all of Sucre and northern Monagas. 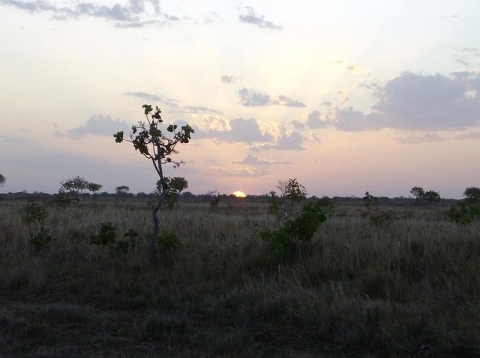 The Llanos region comprises a third of the country's area north of the Orinoco River. South of it lies the Guiana Shield, a massive Precambrian geological formation featuring tepuis, mysterious table-like mountains. The Insular Region includes all of Venezuela's island possessions: Nueva Esparta and the various Federal Dependencies. The Deltaic System, which forms a triangle covering Delta Amacuro, projects northeast into the Atlantic Ocean. Though Venezuela is entirely situated in the tropics, its climate varies from humid low-elevation plains, where average annual temperatures range as high as 28° C (82° F), to glaciers and highlands (the páramos) with an average yearly temperature of 8° C (46° F). Annual rainfall varies between 430 millimetres (17 in) in the semiarid portions of the northwest to 1,000 millimetres (39 in) in the Orinoco Delta of the far east. Most precipitation falls between June and October (the rainy season or "winter"); the drier and hotter remainder of the year is known as "summer", though temperature variation throughout the year is not as pronounced as at temperate latitudes. Human habitation of Venezuela is estimated to have commenced at least 15,000 years ago from which period leaf-shaped tools, together with chopping and plano-convex scraping implements, have been found exposed on the high riverine terraces of the Rio Pedregal in western Venezuela. Late Pleistocene hunting artifacts, including spear tips, have been found at a similar series of sites in northwestern Venezuela known as "El Jobo"; according to radiocarbon dating, these date from 13,000 to 7,000 BC. In the 16th century, when the Spanish colonization of Venezuela began, indigenous peoples such as the Mariches, themselves descendants of the Caribs, were systematically killed. Indian caciques (leaders) such as Guaicaipuro and Tamanaco attempted to resist Spanish incursions, but were ultimately subdued; Tamanaco was put to death by order of Caracas' founder Diego de Losada. 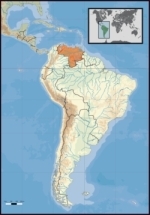 Venezuela was first colonized by Spain in 1522 in what is now Cumaná. These portions of eastern Venezuela were incorporated into New Andalusia. Administered by the Audiencia of Santo Domingo since the early 16th century, most of Venezuela became part of the Viceroyalty of New Granada in the early 18th century, and was then reorganised as an autonomous Captaincy General starting in 1776. After a series of unsuccessful uprisings, Venezuela—under the leadership of Francisco de Miranda, a Venezuelan marshal involved in the French Revolution—declared independence on July 5, 1811. This began the Venezuelan War of Independence. However, a devastating earthquake that struck Caracas in 1812, together with the rebellion of the Venezuelan llaneros, helped to bring down the first Venezuelan republic. 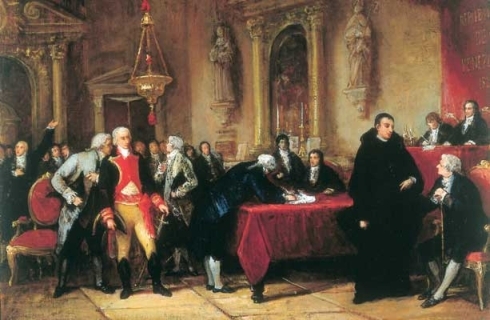 A second Venezuelan republic, proclaimed on August 7, 1813, lasted several months before being crushed as well. Sovereignty was only attained after Simon Bolivar, aided by José Antonio Páez and Antonio José de Sucre, won the Battle of Carabobo on June 24, 1821. José Prudencio Padilla and Rafael Urdaneta's victory in the Battle of Lake Maracaibo on July 24, 1823, helped seal Venezuelan independence. New Granada's congress gave Bolivar control of the Granadian army; leading it, he liberated several countries and founded Gran Colombia. 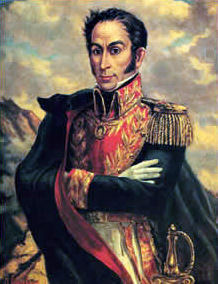 Sucre, who won many battles for Bolivar, went on to liberate Ecuador and later become the second president of Bolivia. Venezuela remained part of Gran Colombia until 1830, when a rebellion led by Páez allowed the proclamation of a new Republic of Venezuela; Páez became its first president. Much of Venezuela's nineteenth century history was characterised by political turmoil and dictatorial rule. During first half of the 20th century, caudillos (military strongmen) continued to dominate, though they generally allowed for mild social reforms and promoted economic growth. Following the death of Juan Vicente Gómez in 1935 and the demise of caudillismo (authoritarian rule), pro-democracy movements eventually forced the military to withdraw from direct involvement in national politics in 1958. Since that year, Venezuela has had a series of democratically elected governments. The discovery of massive oil deposits during World War I prompted an economic boom that lasted into the 1980s; by 1935, Venezuela's per capita gross domestic product was Latin America's highest. After World War II the globalisations and heavy immigration from Southern Europe (mainly from Spain, Italy, Portugal) and poorer Latin American countries markedly diversified Venezuelan society. The huge public spending and accumulation of internal and external debts by the government and private sector during the Petrodollar years of the 1970s and early 1980s, followed by the collapse of oil prices during the 1980s, crippled the Venezuelan economy. As the government devalued the currency in order to face its mounting local and non-local financial obligations, Venezuelans' real standard of living fell dramatically. A number of failed economic policies and increasing corruption in government and society at large, has led to rising poverty and crime and worsening social indicators and increasing political instability, resulting in two major coup attempts in 1992. In the February 1992 coup, Hugo Chávez, a former paratrooper, attempted to overthrow the government of President Carlos Andrés Pérez as anger grew against the president's economic austerity measures. Chávez was unsuccessful and was placed in jail. In November 1992, another unsuccessful coup attempt occurred, organized by other revolutionary groups in the Venezuelan Armed Forces and those that remained from Chávez’s previous attempt. In 1998, Chávez was elected president as a reaction against the established political parties and the corruption and inequalities their policies created. His reform program, which he calls the "Bolivarian Revolution", is aimed largely at redistributing the benefits of Venezuela's oil wealth to the lower socio-economic groups by using it to fund programs such as health care and education. Agricultural land redistribution has also been undertaken on a small scale. His program has encountered great resistance by the previous establishment. In April 2002 it removed him via a coup d'etat; however, he was returned to power after two days as a result of popular demonstrations in his favour and action by loyal sections of the military. He also survived a management-led strike/lockout in the state oil company, PDVSA, in December 2002 - February 2003, and a recall referendum in August 2004. The petroleum sector dominates Venezuela's mixed economy, accounting for roughly a third of GDP, around 80% of exports, and more than half of government revenues. They also have gold, diamonds, and iron ore but they do not have as great of an impact on the economy. Venezuela contains some of the largest oil and natural gas reserves in the world. It consistently ranks among the top ten crude oil producers in the world. The country's main petroleum deposits are located around and beneath Lake Maracaibo, the Gulf of Venezuela (both in Zulia), and in the Orinoco River basin (eastern Venezuela), where the country's largest reserve is located. Venezuela has the least expensive petrol in the world because of its high government subsidies. When oil was discovered at the Maracaibo strike in 1922, Venezuela's dictator Juan Vicente Gómez allowed Americans to write Venezuela's petroleum law. But oil history was made in 1943 when Standard Oil of New Jersey accepted a new agreement in Venezuela based on the 50-50 principle, "a landmark event." Terms even more favourable to Venezuela were negotiated in 1945, after a coup brought to power a left-leaning government that included Juan Pablo Pérez Alfonso. 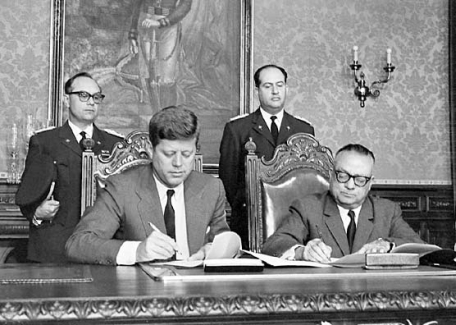 In 1958 a new government again included Pérez Alfonso, who devised a plan for the international oil cartel that would become OPEC. In 1973 Venezuela voted to nationalise its oil industry outright, effective January 1, 1976, with Petróleos de Venezuela (PDVSA) taking over and presiding over a number of holding companies; in subsequent years, Venezuela built a vast refining and marketing system in the U.S. and Europe. Economic prospects remain highly dependent on oil prices and the export of petroleum. A founding member of the Organization of Petroleum Exporting Countries (OPEC), Venezuela reasserted its leadership within the organization during its year as OPEC's president, hosting the organization's Second Leadership Conference in 40 years, as well as having its former Minister of Energy, Alvaro Silva Calderon, appointed as Secretary General. The collapse of oil prices in 1997-98 prompted the Rodriguez administration to expand OPEC-inspired production cuts in an effort to raise world oil prices. In 2002, this sector accounted for roughly a quarter of GDP, 73% of export earnings, and about half of central government's operating revenues. Venezuela is the fourth-leading supplier of imported crude and refined petroleum products to the United States. The Government of Venezuela has opened up much of the hydrocarbon sector to foreign investment, promoting multi-billion dollar investment in heavy oil production, reactivation of old fields, and investment in several petrochemical joint ventures. Almost 60 foreign companies representing 14 different countries participate in one or more aspects of Venezuela's oil sector. The Venezuelan national oil company Petroleos de Venezuela, S.A. (PDVSA) and foreign oil companies have signed 33 operating contracts for marginal fields in three bidding rounds. New legislation dealing with natural gas and petrochemicals is further opening the sector. A new domestic retail competition law, however, disappointed investors who had been promised market-determined prices. On November 13, 2001, under the enabling law authorized by the National Assembly, President Chávez enacted the new Hydrocarbons Law, which came into effect in January 2002. This law replaced the Hydrocarbons Law of 1943 and the Nationalisation Law of 1975. Among other things, the new law provided that all oil production and distribution activities were to be the domain of the Venezuelan state, with the exception of joint ventures targeting extra-heavy crude oil production. Under the new Hydrocarbons Law, private investors can own up to 49% of the capital stock in joint ventures involved in upstream activities. The new law also provides that private investors may own up to 100% of the capital stock in ventures concerning downstream activities, in addition to the 100% already allowed for private investors with respect to gas production ventures, as previously promulgated by the National Assembly. During the December 2002-February 2003 lock-out where managers and skilled highly-paid technicians of PDVSA locked out PDVSA and sabotaged the industry, petroleum production and refining by PDVSA almost ceased. At the same time, many business owners across Venezuela closed down their stores, both actions being an attempt to destabilise the Chávez government. Despite the lock-out, these activities eventually were substantially restarted when the rank-and-file oil workers restarted PDVSA without the managers. Out of a total of 45,000 PDVSA management and workers, 19,000 were subsequently dismissed; many of which were managers and highly paid technicians. Manufacturing contributed 17% of GDP in 2006. The manufacturing sector continues to increase dramatically at a rate of 26.93% annually. Venezuela manufactures and exports steel, aluminum, transport equipment, textiles, apparel, beverages, and foodstuffs. It produces cement, tires, paper, fertilizer, and assembles cars both for domestic and export markets. Agriculture accounts for approximately 3% of GDP, 10% of the labour force, and at least one-fourth of Venezuela's land area. Venezuela exports rice, corn, fish, tropical fruit, coffee, beef, and pork. The country is not self-sufficient in most areas of agriculture; Venezuela imports about two-thirds of its food needs. In 2002, U.S. firms exported $347 million worth of agricultural products, including wheat, corn, soybeans, soybean meal, cotton, animal fats, vegetable oils, and other items to make Venezuela one of the top two U.S. markets in South America. The United States supplies more than one-third of Venezuela's food imports. Thanks to petroleum exports, Venezuela usually posts a trade surplus. In recent years, nonpetroleum exports have been growing rapidly but still constitute only about one-fourth of total exports. The United States is Venezuela's leading trade partner although Brazil is expected to surpass the U.S. by 2011. During 2002, the United States exported $4.4 billion in goods to Venezuela, making it the 25th-largest market for the U.S. Including petroleum products, Venezuela exported $15.1 billion in goods to the U.S., making it its 14th-largest source of goods. Venezuela's birth rate is among the highest in South America, after Bolivia, Paraguay and French Guyana. Since 1930, Venezuelan census does not contain information about ethnicity so only rough estimates are available. Some 70% of the population are Mestizo, defined as a mixture of European and Amerindians; another 20% are unmixed whites, mostly of Spanish, Italian, Portuguese and German descent. Two of the main Amerindian tribes located in the country are the Wayuu, located in the west, in Zulia, and the Timotocuicas, also in the west, in Mérida, in the Andes. Other important groups include Afro-Venezuelans, though their numbers are unclear due to poor census data. Asians, Lebanese and other Arabs and Chinese make up a small percentage of the population. Only about 5% of Venezuelans are indigenous. 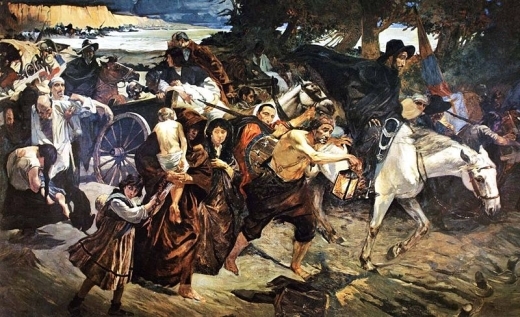 These groups were joined by sponsored migrants from throughout Europe and neighbouring parts of South America by the mid-20th century economic boom. According to the World Refugee Survey 2008, published by the U.S. Committee for Refugees and Immigrants, Venezuela hosted a population of refugee and asylum seekers from Colombia numbering 252,200 in 2007. 10,600 new asylum seekers entered Venezuela in 2007. About 85% of the population live in urban areas in northern Venezuela; 73% live less than 100 kilometres (62 mi) from the coastline. 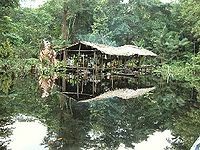 Though almost half of Venezuela's land area lies south of the Orinoco, only 5% of Venezuelans live there. The national and official language is Spanish; 31 indigenous languages are also spoken, including Guajibo, Pemon, Warao, Wayuu, and the various Yanomaman languages. According to government estimates, 92% of the population is at least nominally Roman Catholic, and the remaining 8% Protestant, a member of another religion, or atheist. The Venezuelan Evangelical Council estimates that Evangelical Protestants constitute 10% of the population. The Venezuelan president is elected by a vote with direct and universal suffrage, and functions as both head of state and head of government. The term of office is six years, and a president may be re-elected an unlimited number of times as of February 15, 2009. The president appoints the vice-president and decides the size and composition of the Cabinet and makes appointments to it with the involvement of the legislature. The president can ask the legislature to reconsider portions of laws he finds objectionable, but a simple parliamentary majority can diminish these objections. 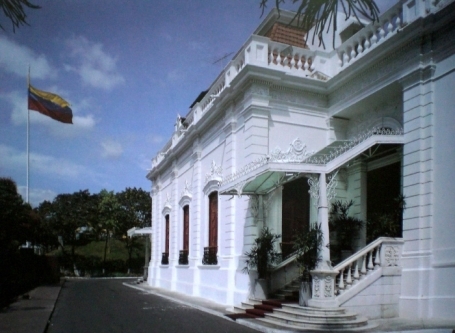 The unicameral Venezuelan parliament is the National Assembly or Asamblea Nacional. Its 167 deputies, of which three are reserved for indigenous people, serve five-year terms and may be re-elected for a maximum of two additional terms. They are elected by popular vote through a combination of party lists and single member constituencies. The highest judicial body is the Supreme Tribunal of Justice or Tribunal Supremo de Justicia, whose magistrates are elected by parliament for a single twelve-year term. The National Electoral Council (Consejo Nacional Electoral, or CNE) is in charge of electoral processes; it is formed by five main directors elected by the National Assembly. The voting age in Venezuela is 18 and older. 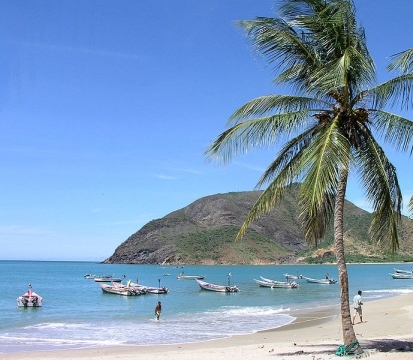 Venezuela's heritage, art, and culture have been heavily influenced by the Caribbean context. These elements extend to its historic buildings, architecture, art, landscape, boundaries, and monuments. Venezuelan culture has been shaped by indigenous, Spanish and African influences. Before this period, indigenous culture was expressed in art (petroglyphs), crafts, architecture (shabonos), and social organization. Aboriginal culture was subsequently assimilated by Spaniards; over the years, the hybrid culture had diversified by region. Venezuelan art was initially dominated by religious motifs but began emphasizing historical and heroic representations in the late 19th century, a move led by Martin Tovar y Tovar. Modernism took over in the 20th century. Notable Venezuelan artists include Arturo Michelena, Cristóbal Rojas, Armando Reverón, Manuel Cabré; the kinetic artists Jesús-Rafael Soto and Carlos Cruz-Diez; and contemporary artist Yucef Merhi. Venezuelan literature originated soon after the Spanish conquest of the mostly pre-literate indigenous societies; it was dominated by Spanish influences. 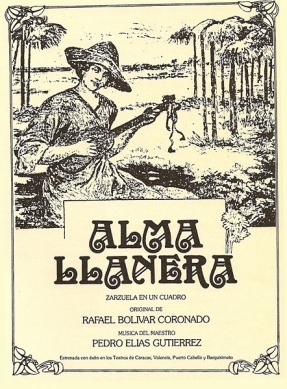 Following the rise of political literature during the War of Independence, Venezuelan Romanticism, notably expounded by Juan Vicente González, emerged as the first important genre in the region. Although mainly focused on narrative writing, Venezuelan literature was advanced by poets such as Andrés Eloy Blanco and Fermin Toro. Major writers and novelists include Rómulo Gallegos, Teresa de la Parra, Arturo Uslar Pietri, Adriano González León, Miguel Otero Silva, and Mariano Picón Salas. The great poet and humanist Andrés Bello was also an educator and intellectual. Others, such as Laureano Vallenilla Lanz and José Gil Fortoul, contributed to Venezuelan Positivism. 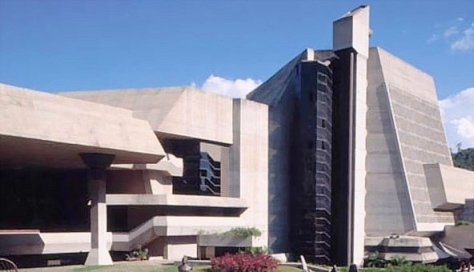 Carlos Raúl Villanueva was the most important Venezuelan architect of the modern era; he designed the Central University of Venezuela, (a World Heritage Site) and its Aula Magna. Other notable architectural works include the Capitolio, the Baralt Theatre, the Teresa Carreno Cultural Complex, and the General Rafael Urdaneta Bridge. 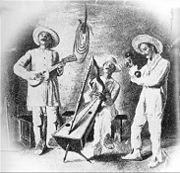 Indigenous musical styles of Venezuela are exemplified by the groups Un Solo Pueblo and Serenata Guayanesa. 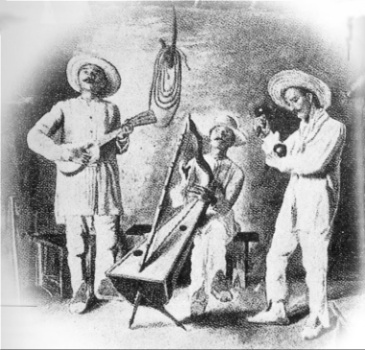 The national musical instrument is the cuatro. 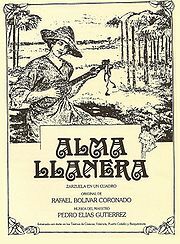 Typical musical styles and pieces mainly emerged in and around the llanos region, including Alma Llanera (by Pedro Elias Gutiérrez and Rafael Bolivar Coronado), Florentino y el Diablo (by Alberto Arvelo Torrealba), Concierto en la Llanura by Juan Vicente Torrealba, and Caballo Viejo (by Simon Dtaz). The Zulian gaita is also a popular style, generally performed during Christmas. The national dance is the joropo. Teresa Carreno was a world-famous 19th century piano virtuosa. In the last years, Classical Music has had great performances. The Simon Bolivar Youth Orchestra has realised excellent presentations in many European concert halls, notably at the 2007 Proms, and has received honours of the public. Venezuela is well-known for its successions in beauty pageants. Miss Venezuela is a big event in the country, and Venezuela has received 5 Miss World, 5 Miss Universe and 5 Miss International titles. The name "Venezuela" is believed to have originated from Amerigo Vespucci who, along with Alonso de Ojeda, led a 1499 naval expedition along the northwestern coast's Gulf of Venezuela. On reaching the Guajira Peninsula, the crew observed villages (palafitos) that the people had built over the water. This reminded Vespucci of the city of Venice (Italian: Venezia), so he named the region "Venezuola", meaning "little Venice" in Italian. In Spanish, the suffix -zuela is used as a diminutive term (e.g., plaza / plazuela, cazo / cazuela); thus, the term's original sense would have been that of a "little Venice". Martin Fernández de Enciso, a member of the Vespucci and Ojeda's crew, states in his work Summa de Geografia that the indigenous population they found were called "Veneciuela", suggesting that the name "Venezuela" may have evolved from a native word. The Vespucci story, however, remains the most popular and accepted version of the origin of the country's name.